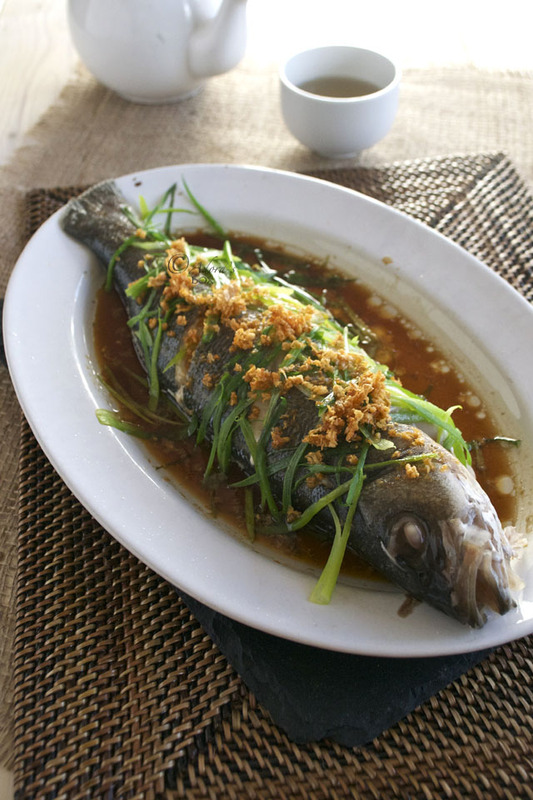 Fish plays a big role in Chinese celebrations. When served whole, including the head and the tail, it beckons a good beginning and end to the year. The Chinese word for fish "Yu" sounds like the words for wish and abundance. 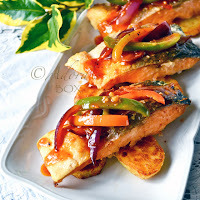 Eating fish on Chinese new year symbolizes prosperity for the whole year. This recipe is one of the most, if not the most, popular fish dish in Chinese restaurants. This was one of the first recipes I learned from my Mother-in-law. She taught me not to salt the fish before cooking it as it toughens the flesh. I cook this a lot at home even on ordinary days because it is one of the easiest dishes to cook. If you do not have a steamer, you can just use a wok with a domed lid. Set the dish on a trivet and add water to the wok. Pre-heat a steamer or a wok. Put the cleaned fish on a platter. Sprinkle 1 tbsp. of the sugar inside the fish and 1 tbsp. on top of the fish. 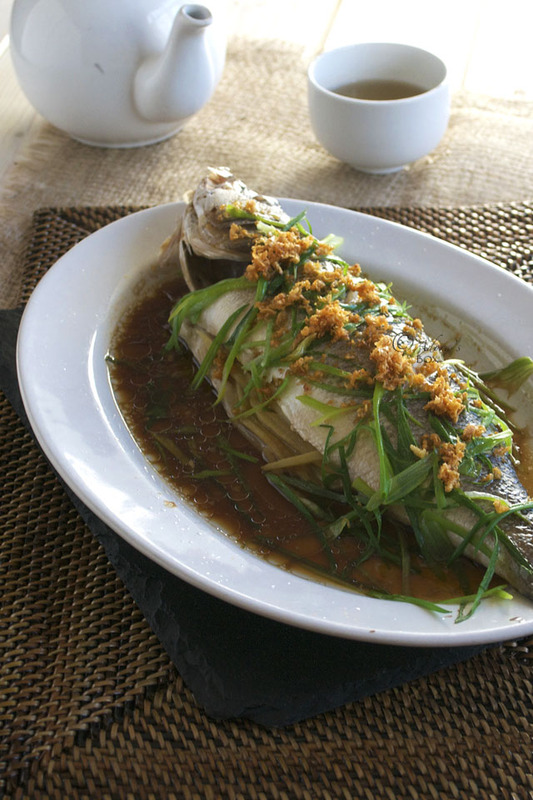 Put a few strips of the ginger and white parts of the spring onions inside the fish. Put the rest on top of the fish. Top with the Chinese mushroom strips and sherry and steam for 10-15 minutes or until the fish is cooked. To test, part the toppings, and cut a slit on top of the fish. If the knife goes in easily, the flesh is opaque and there's no red streaks on the fish bones, then it is done. Top with the green part of the spring onions and pour in the soy sauce and sesame oil. Scoop a few spoonfuls of sauce on top of the fish. Heat up the oil and fry the garlic for one minute. Immediately pour on top of the spring onions. Serve the fish while hot. wow, that's some good looking fish. This recipe is wonderful and I'm looking forward to trying it out. Doesn't hurt to be prepared with the good luck part either! 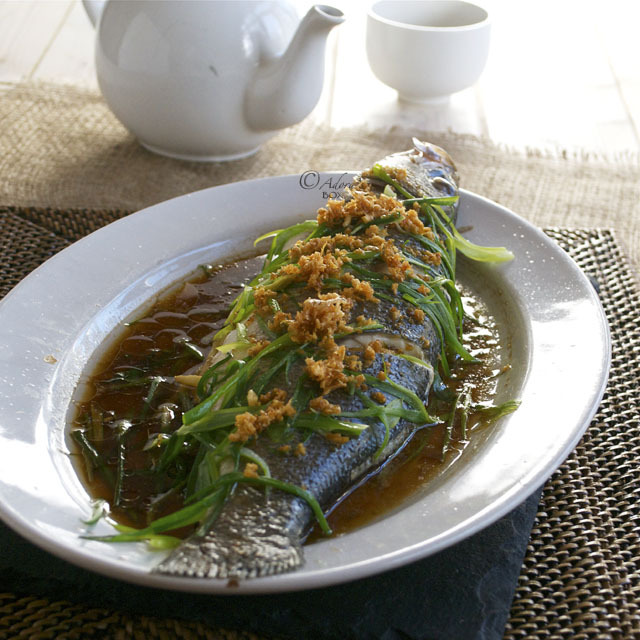 Yes, by pouring the hot oil onto the spring onion makes a great different on any dish especially steam fish !! Adora, why you season the fish with sugar ? I found the best way must season it with some salt so that the flesh will be more tasty !! If possible add some cooking wine to remove the fishy smell !! 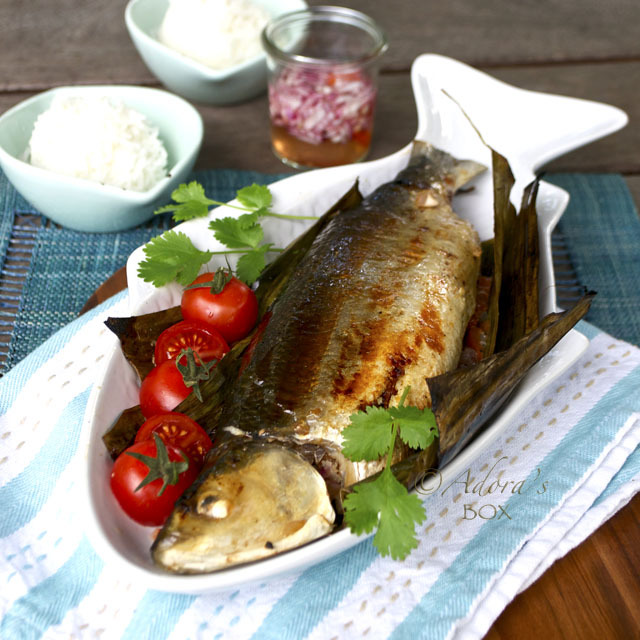 I often lift up the fish when steaming by placing the crushed white part of spring onion , sliced ginger on the plate then top the fish on them. Or a pair of chopsticks below the fish so that the 2 sides will get the same amount of steam when steaming. Not everyone has a wok, a big pot can use for steaming. 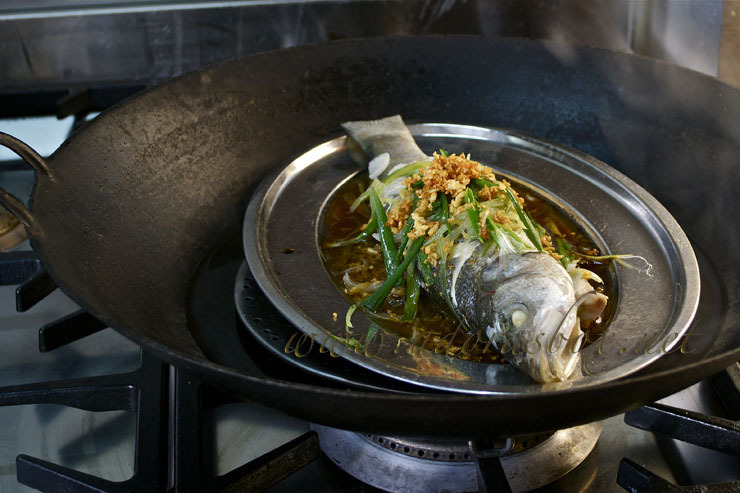 If you don't have a stand for steaming, use a bowl/ plate then place the fish on top and steam as long as you can cover your wok or pot !! 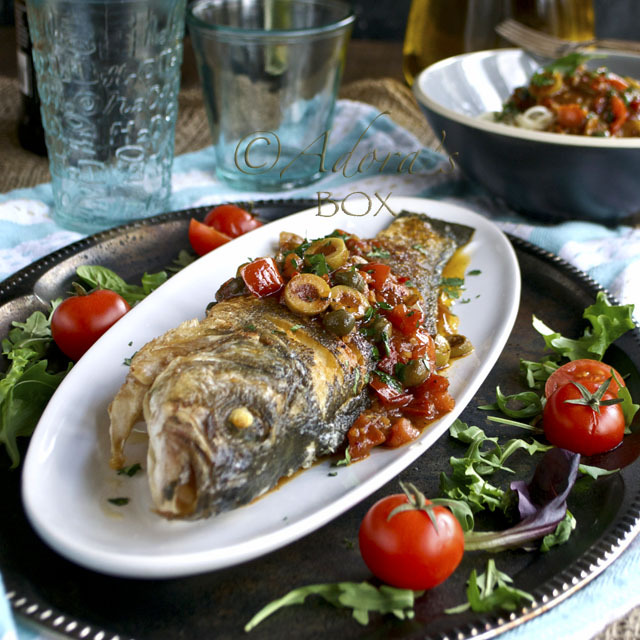 ( make sure the water will not touch your fish's plate and you will get a fish soup after steaming it ! !